Such wonderful, brilliantly colourful plants with bracts in so many electric shades! 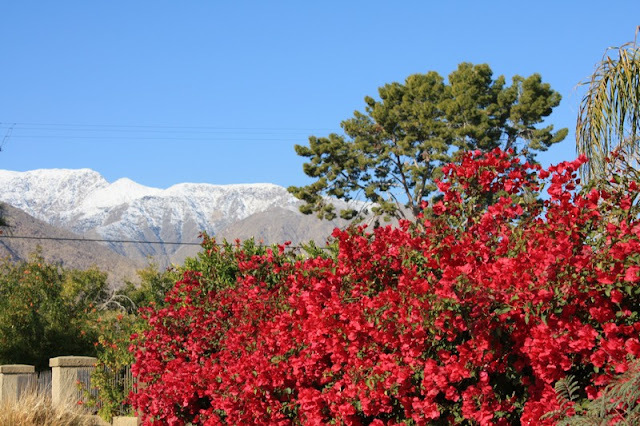 They just thrive here in the desert, tolerate the searing summer heat and continue bravely flowering throughout the chill of the winter when the temperatures can drop near to freezing. 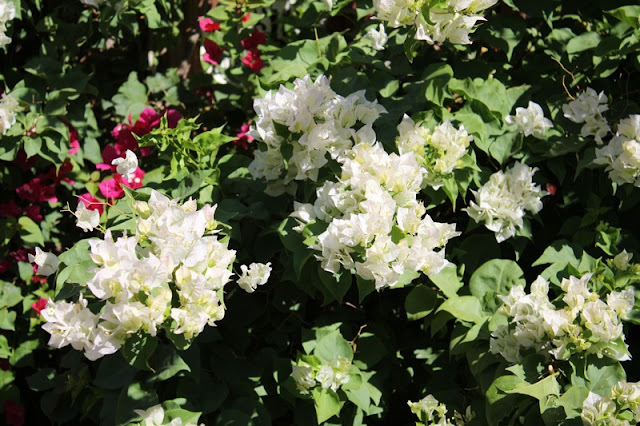 First discovered in South America in the 18C and named after the French explorer Louis Antoine de Bougainville, they are now widely planted in many warm regions. In our little yard here in the USA, we have six different types. A dark red vigorous cultivar, 'Scarlet O'Hara', has grown well and softens the back of our condo. Last spring a humming bird made her nest on one of the slender branches, rather delaying spring pruning! Four dwarf cultivars have proved to be a learning experience! They were potted last year and grew exceedingly well over summer but have been shy to flower, probably as a result of over generous feed and water. They also succumbed to attack by looper caterpillars, which rather wrecked the foliage of the variegated ones. Now in late winter growth has slowed and we have some flower. I'll give them another year to prove their real worth! Most are hybrids and it is difficult to identify the many similar coloured cultivars in existence, anything from compact spreading types up to monsters growing to 12m or more. Bougainvilleas are prickly plants with vicious spines, as anyone who prunes them will soon find out! They are therefore scramblers rather than climbers, latching on wherever the spines catch. 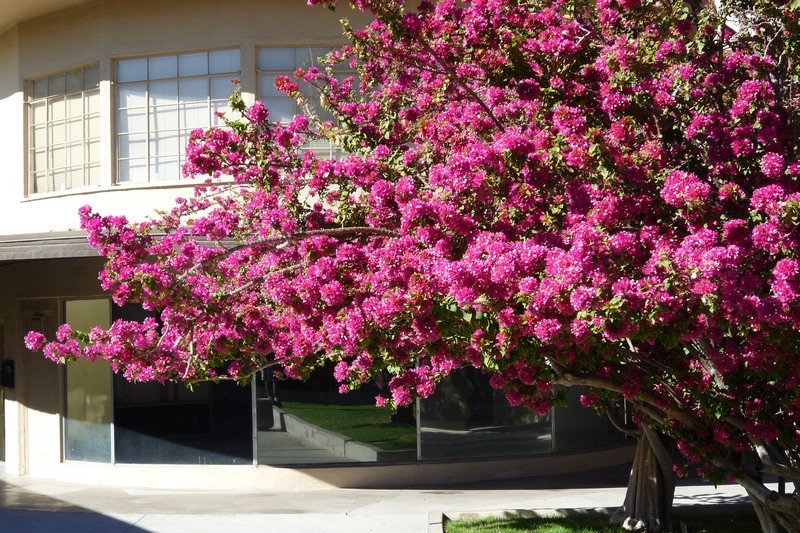 The exception is Bougainvillea arborea, a species which makes relatively stocky growth and in time will achieve tree proportions. 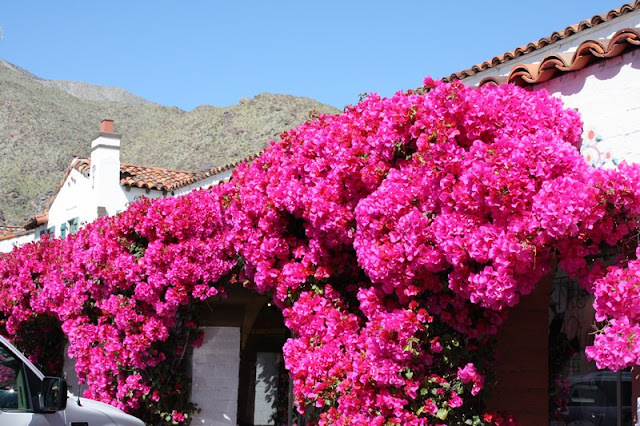 The best bougainvilleas seem to be in in gardens that are relatively neglected, where they are allowed to grow freely and then flower profusely. Sadly in many gardens, they are often over-pruned and much of the flowering potential is removed. 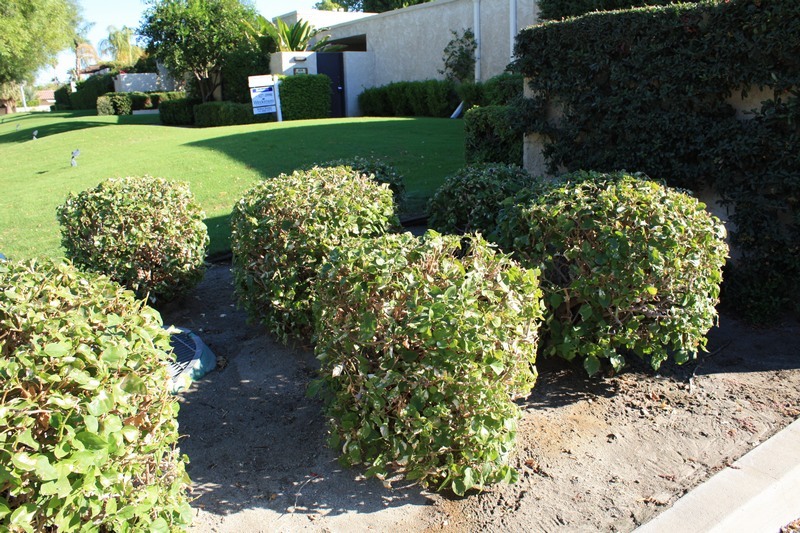 It seems so pointless to see teams of professional gardeners pruning off all the flowering growths with hedge trimmers. I just don't see the logic! Just outside the garages in our community, there is a whole bed of bougainvilleas regularly pruned to shapeless blobs - so pointless! In the UK bougainvilleas must be grown as pot plants and overwintered under frost-free glass. Each year at the Chelsea Flower Show, Westdale Nurseries present an amazing display of flowering bougainvillea. 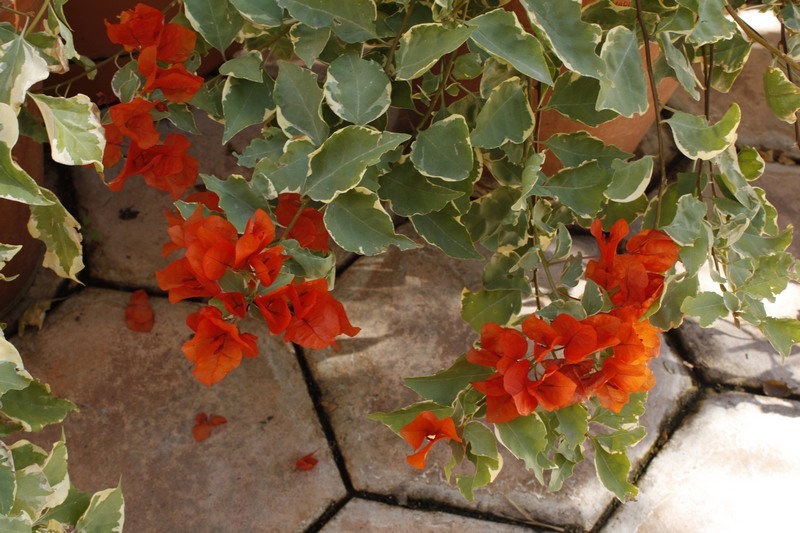 They can excel as conservatory plants, have few pests and diseases and provide summer colour for many months.